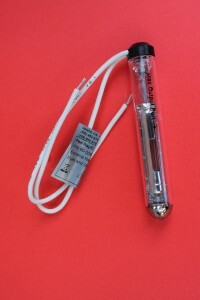 Low pressure Zinc Lamps are major sources of extreme short wave UV radiation. They produce a variety of spectral lines with the strongest at 213.9 nm. The lamps incorporate a special processing technique. Zinc Lamps offer an exceptionally long life, In addition, are constructed with a special vacuum jacket around the double bore body and heat shield. The jacket isolates the lamp body, with the zinc arc, from the external environment. This gives the lamp body excellent temperature stability resulting in very low noise and steady lamp intensity that is relatively indipendent of external temperature fluctuations. The radiance from the lamp comes from two ports located in opposite sides of the lamp. This radiance can be used from both ports simultaneously, from a single port, and from any portion of the arc. A high output mark on the lamp informs the user which of the two ports is to be used for maximum output.